Maj. Michael Penney, professor and chair of the UT Military Science and Leadership Department, will be promoted by the U.S. Army to lieutenant colonel Friday, July 6. The ceremony will take place at 11 a.m. in Thompson Student Union Room 2592. Penney is originally from North Texas and received a BBA from Midwestern State University in Wichita Falls, Texas. Since then, he has earned master’s degrees from both Webster University and the Army’s School of Advanced Military Science. He was commissioned by the Army’s Officer Candidate School in 2002. 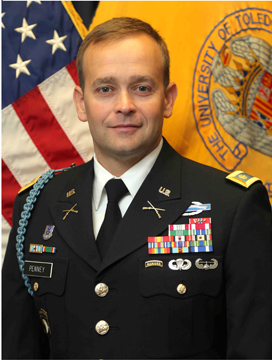 Penney came to UT from Carson, Colo., where he served from 2014 to 2017. His time there included two operational deployments — to Europe and to Afghanistan. Last July, Penney joined the UT faculty as professor and chair of military science and leadership. Through his department chair position, Penney oversees recruiting, retention, preparation and leadership development of cadets along their path toward their goal of being awarded a commission as an officer in the U.S. Army, Army Reserves or the Army National Guard. He also instructs Military Science and Leadership Level Four Cadets throughout their transition from Cadet to Army Officer and works directly with UT’s University College and its ROTC program. Penney will remain at UT for one more year and then take command of a battalion in South Carolina. This entry was posted on Tuesday, July 3rd, 2018 at 3:54 am and is filed under Events, News, University College, UToday .